“As major search engines can’t yet make sense of what is being said inside a video or where and who is being portrayed, unless you take the time to learn how to provide relevant and detailed video metadata efficiently to those services who will distribute your video content, you take a high risk of publishing video content that no-one will ever see. a) Operational, automatically gathered video metadata, which is typically a set of automatically-generated information about the content you produce, such as the equipment you used, the software you employed, the date you created your content, GPS coordinates of shooting location, and more. 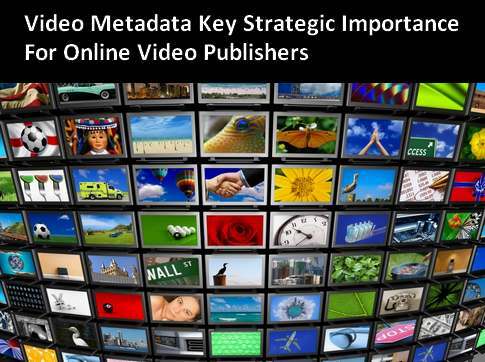 b) Human-authored video metadata, which can be created, aimed at providing more search engine visibility, audience engagement, and better advertising opportunities for online video publishers. Originally written by the Gotuit Team and first published as “ The Currency of Internet Video” on October 1st, 2008. Just like images can be indexed, we will have videos act in the same way. It’s just a matter of finding a way of tagging the videos so those tags can reflect their content. Thanks for the info man…this is cool now I really know the importance of online video publishing…. Video SEO is a tactical process of increasing the search engine rankings your video. If no. of visits to the video increased this is in turn increases the number of customers to your website, and your Business will increase dramatically. More and more of our small business clients are utilizing Video content online to promote their brand and really broaden the reach of their marketing. Thanks for sharing some tips for some other sites to create and promote channels. In order to convey the essence of what constitutes good metadata, we’ll rely on a simple illustrative example that addresses a common consideration in authoring metadata – should metadata be authored by people, as is most of the video production process, or should it be automated. Great presentation outlining the major points in the field. Video is very much still unchartered waters in terms of its utilization for ecommerce even though we’ve seen client’s more than double conversion rates when enhancing their product pages with video.